Congrats Elvis on your little pig. Always great to have a successful hunt. Should be some good eats their. I can't imagine the response from my wife if I asked her to help out. I lied. I can imagine it. Wouldn't be very printable. 5 inches of rain is a light shower on the west coast of the south island. Oh you think you're smart....well I just looked up your average annual rainfall and it's actually just about the same as Astoria. Yours is 62 inches (1600mm) and Astoria's is 67inches (1701.8mm)....so there. Astoria had a record single day rainfall back in 1933 (stretching my lead) of 36.1 inches (916.94mm) yeah....in a single day, like up to your waist in a single day. The average for the entire state (of Oregon) is half of what Astoria's annual average is. I noticed New Zealand's south island has quite a few variations in annual rainfall, depending on where you're at. Similar to Oregon also, some parts of Oregon are desert and other parts are like a rain forest. Love it when you can choose such a variety of weather conditions in a single state. We're just a few miles away Elvis. 4 roasts....2 bags of chops..and 2 small flaps to go in next lot of bangers. had a forequarter roast for tea tonight...guys Ive eaten a heck of a lot of pork in my 41 years but this one was up there if not the very best ever.....hard to stop slicing more off even though puku is bursting at the seams!!!! You better be careful young fellah, too much pork and you will pop. Great catching up the other night and good luck with the next hunt. good luck with the next hunt. Won't that be in their backyard with the two wee ones he brought home? Elvis, keep us updated on their progress. Well done Elvis, good shooting mate. I like what you did with the suckers too mate...Christmas dinner in the making. I lay bets right now that these "cutties" never make it to the dinner table. They are adorable!!! BIG mistake letting them into the house. I reckon you got that in one Slim...and I'll almost lay odds the kids have already named them...a sure way to escape the pot. 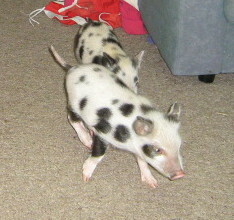 I'll almost lay odds the kids have already named them...a sure way to escape the pot. Ok, Elvis, what are their names? 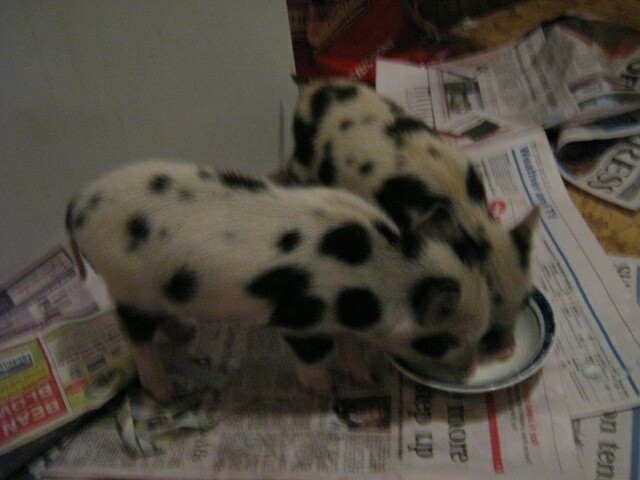 ham is the bigger lighter coloured one and bacon is the stroppy darker/smaller one. You've still lost the battle. I tried to prevent the kids from keeping a stray injured cat and told them they couldn't name her and that we would only call her "kitty". It was 15 years before she passed and she bugged me every day.